How do I register my child for Spotlight? Registration can be done through Spotlight’s website here. You can also call (301) 252-0112. Do participants need to have prior drama experience? No. Spotlight is a great fit for children, teens with or without prior experience. Spotlight also welcomes beginners to advanced students but more importantly people that want to learn, experience theatre, and grow as an artist. Do participants need to audition? There are no auditions to get into the program. Everyone who registers for Spotlight’s productions, will be in the show. Auditions take place the second rehearsal to determine who will get which part. How big are the classes/productions? Production sizes range depending on enrollment however the classes are limited to give all actors the best opportunity to learn and grow with our instructors. Is there a performance at the end of the program session? Yes each participant will perform in one or two productions depending on the size of the cast. Where are the rehearsals and productions located? When is registration? What is the fee and what does it include? Registrations will begin in November and the fee will depend on the age of the participant and the date of registration. Spotlight offers discounts for Early Bird registration as well as a sibling discount if you have 2 or more children that are interested in the program. The Registration Fee for Spotlight Musical Theatre includes all of the rehearsals, time in the theatre, costumes and performance material. Please go to www.spotlightmusicalsMtAiry.com/register-today to complete your registration. Once you do so, you will be emailed a link to fill out all of your information. Why is there a registration fee to participate in Spotlight? There are also a lot of costs involved in putting on a professional Musical Theatre production such as the cost for rehearsals, theatre rentals, costumes, sets, props, sound and lighting operators, licensing fees for the musicals, insurance, etc. Spotlight is not government funded which is why we charge a small amount to the participants. The registration fee merely helps to offset the costs of putting on professional productions with the highest standards. Unfortunately Spotlight Musical Theatre does not offer refunds. However we would be happy to give you a credit towards a future production or our Summer Camp Musical Theatre program. What if my child doesn’t get the part he/she wants? We assure students that regardless of what part they receive we will give them opportunities to stand out and showcase their talents. We try to give each person lines and the most amount of stage time possible. With many students auditioning for a limited number of roles, the decisions of the Directors are not easy. This is admittedly the most difficult aspect of their job. We encourage each artist to take the role and lines they have and perform them to the best of their ability. Spotlight encourages growth and training to create the most talented artists possible. Can parents and teachers watch rehearsals? Spotlight has closed rehearsals. Parents are allowed to wait outside the rehearsal area but are not allowed to be inside of the rehearsal. What if my child is under 8 but has experience in shows and doesn’t want to be with the little kids? If you child has the experience or confidence to be in the Senior company but is under eighte, Spotlight will consider moving up your child. Please email spotlightmusicalsmd@gmail.com. 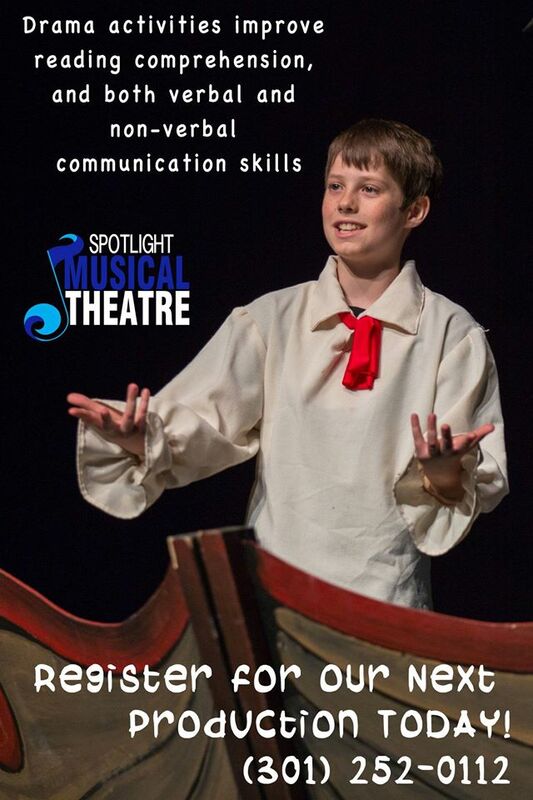 You can learn all about our talented staff at www.spotlightmusicalsmtairy.com/Staff In addition, parents or Spotlight interns may be assisting on a production-to-production basis. Who do I call if I have other questions?